Marcus Maddison scores a stunning goal against Shrewsbury. 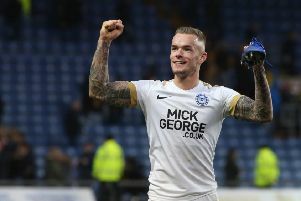 Posh star Marcus Maddison is in the running to win the Skybet League One Goal of the Month Award for October. The midfield maestro scored the only goal of the game against Shrewsbury Town on October 28 and it was a brilliant strike. He spotted the chance to drive a 40-yard volley over the head of stranded visiting keeper Dean Henderson. The other two contenders shortlisted for the award are Doncaster’s Ben Whiteman, who demonstrated impeccable technique to sweep home a thigh-high volley against Southend, and Plymouth’s Graham Carey, who weaved his way between two defenders and stroked a pinpoint 20-yard strike into the top corner against Shrewsbury. The winner will be chosen by a fan poll on skysports.com. Voting opens tomorrow (November 10) and closes on Tuesday November 14. The winner will be announced on Friday November 17.